Albi is a commune in southern France’s Midi-Pyrénées region on the River Tarn. 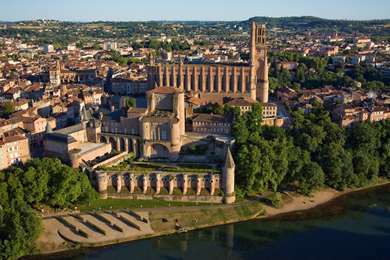 Albi is about 85km north-east of Toulouse and is the seat of the Diocese of Albi. The town is centred around its cathedral, which was added to UNESCO’s list of World Heritage Sites in 2010. The town has conserved its architectural heritage, which represents its various periods of history. Its historical area covers 63 hectares. The first human settlement on the site was in the Bronze Age, but after the Roman conquest of Gaul in 51 BC the town became Civitas Albigensium. Archaeological digs have not revealed remains of any Roman buildings, suggesting it was only a modest Roman settlement. The town expanded in 1040 but the region suffered during the Albigensian Crusade when countless Cathars were burnt for heresy. Following this, the town constructed its cathedral of Sainte-Cecile.